The Webb-Deane-Stevens Museum Colonial Revival Garden was designed by Amy Cogswell, one of the first female landscape architects in the U.S.
Wethersfield, Conn. (May 28, 2014) –The public is invited to view a small piece of the world as it was seen through the eyes of Amy Cogswell—one of the first female landscape architects in the United States and the designer of the Colonial Revival Garden at the Webb-Deane-Stevens (WDS) Museum. On Sunday, June 22, 2014, from noon. to 4 p.m., the WDS Colonial Revival Garden will be one of 14 historic gardens highlighted for Connecticut Historic Gardens Day. Professionally designed gardens were uncommon in the early 20th century, and female landscape architects extremely rare in a field that was traditionally dominated by men. Cogswell attended the first American institution for women studying in her field, the Lowthorpe School of Landscape Architecture, Gardening, and Horticulture for Women, in Groton, Massachusetts. She graduated in 1916 and served as the school’s headmistress from 1916 – 1923. 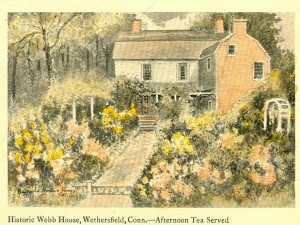 When hired by the Connecticut Society of Colonial Dames, in 1919, Cogswell’s plans for the Webb House’s gem of a garden included classical elements, quaint arbors, and a wide assortment of the “old fashioned” flowers that were popular in the early 1900s. An artist’s’ rendering of the Webb-Deane-Stevens Museum Colonial Revival garden in the 1920s. On Connecticut Historic Gardens Day, WDS garden guides will give free tours of the garden, discuss Cogswell’s vision for the space, answer questions, and hold a drawing for a door prize of the lovely 2014 CT Historic Gardens Day poster. Refreshments will be served on the Webb House porch; optional WDS Museum house tours will be offered at a discount for the day. For more information on the Webb Deane Stevens Colonial Revival garden, visit: http://webb-deane-stevens.org/colonial-revival-garden/. 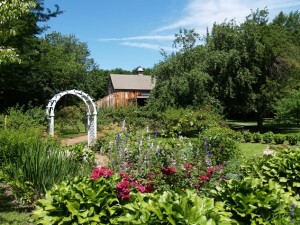 For more information on Connecticut Historic Gardens, visit: www.cthistoricgardens.org. Located in the heart of Connecticut’s largest historic district, the Webb-Deane-Stevens Museum consists of three authentically restored 18th-century homes and provides the quintessential New England experience – from the American Revolution to the early 20th century. Tours include the 1752 Joseph Webb House, where General George Washington met with French General Rochambeau, and planned the military campaign leading to the end of the Revolutionary War, the 1770 Silas Deane House, built for America’s first diplomat to France, and the 1788 Isaac Stevens House – depicting life in the 18th and 19th centuries through original family objects and a fascinating children’s exhibit. For rates and hours visit http://webb-deane-stevens.org or call (860) 529-0612, ext. 12.